This blog is designed to keep you in the loop on the latest nutrition trends. Information is derived from peer-reviewed scientific journals and supported by the Academy of Nutrition. Fruit and its interference with weight loss goals. Help your waistline shrink by following my simple strategies. Is there such a thing as consuming too much fruit? They are natural sugars right? So what happens if you’re trying to lose weight especially with summer just around the corner? I know you’re grazing at those unlimited fruit themed salads, smoothies and desserts. Get the smallest size. Bigger is better? Think again. We live in a world where everything is supersized, even our fruits! Buying the largest apple or banana can affect your weight loss. Fruits are great snacks that serve vitamins, minerals, and fiber, but also carbohydrates, sugar, and calories. Sugar and calories contribute to weight gain if you don’t monitor calories. I recommend always buying the smallest fruit available to help keep portions in check. So if you see a medium apple and a large apple of the same kind, pick up the medium one. If your banana is larger than your cellphone (most are), you’re probably consuming two servings in one sitting. Your day should consist of about 2-4 servings of fruit a day, depending on your activity level and other factors that we will not discuss here. So if you’re sitting at a desk all day, you should most likely aim for 2-3 servings. Oops, did you have that 11 inch banana? Break up with dried fruit. Simply put, they do not equal whole fruit. Fruit that is dried is usually naturally higher in sugar. These fruits also lack the water component which helps to keep you full. You can snack on them for hours, consume triple or even quadruple the calories and still feel hungry! To visualize this better, one cup of apricot has about 20 grams of natural sugar and about 80 calories, however one cup of dried apricot contains 81 grams of natural sugar and 315 calories (I know)! If you must consume dried fruit, always check the label for added sugars and make sure there is none, and only consume one portion. Check your season. Have you ever paid 8 bucks for a box of strawberries just because it was winter? Well, it’s actually best to eat a variety of seasonal fruit and save yourself the extra bucks. This allows for a variety of nutrients throughout the year. So what should you have this summer? Check the time. Carbohydrates fuel cells. When you eat more fruit (carbohydrate) than you burn, the extra calories will be stored as fat (duh). Your body uses carbohydrates efficiently during the day when you are most active. This allows carbohydrates to be used as fuel instead of feeding your waistline. Aim to have your fruit in the morning, between lunch or dinner and before a workout or any activity that requires movement. Having fruit at night gets tricky. It is much better to have fruit for dessert than a cheesecake but if your goal is strictly weight loss than set a rule of no fruit after dinner. Bottom line: Fruits are a perfectly sweet and healthy snack that you can enjoy while watching your weight, just make sure you also watch the portion size and frequency of enjoyment. Instagram’s influence on your eating habits and potential risks. Be mindful of how your Instagram feed makes you feel, and whether it is starting to take over your eating habits. We don’t talk about this often, but we are constantly surrounded and influenced by social media. Many individuals pursue social media sites for the latest diet craze or superfood to help achieve a perfect body and perfect diet. Studies have found a link between social media and disordered eating particularly orthorexia, which is an obsession with eating only healthy foods that can lead to nutrient deficiencies, anxiety, depression and social isolation. Additionally, most of the content that influences this comes from individuals with little to zero background in nutrition. In a study by Turner and Lefevre (2017) published in the journal of Eating Disorders found that 49 percent of people who followed health food accounts on instagram had orthorexia. Many people use social media safely as well, to find healthy eating tips, and healthy plans, however, many times that pursuit becomes an unhealthy preoccupation which can lead to self-punishment. Disordered eating can affect everyone; men, women, boys, girls. Adolescents are at highest risk for falling victim to this type of eating because so much of their knowledge is learned through the internet and social media. On the other hand, adults are at a very high risk as well depending on what their social media feed looks like. If their feed is full of unrealistic messages and advice from the wrong influencer, it can really impact your self esteem. These influencers make you think that you’re doing something wrong because you don’t look or feel like them as a result of having different priorities. Anyone can fall for these triggering images and messages, so below are a few tips to check if your “healthy eating” has gone a bit deep. You avoid dinning out. You don’t dine out because you don’t trust anyone cooking for you since you can’t tell what ingredients are going into your food. You obsess over ingredient in your food. You spend a lot of time obsessing over food, especially its quality and purity. You become consumed with how it was prepared, stored, and its expiration date to make sure its as fresh as it can be. You pretty much strive to only put pure and healthy foods in your body. You never eat dessert. A healthy eater still enjoys dessert on occasion, or even a little every day. If you don’t dare to ever touch dessert unless it’s made from “clean” ingredients and obsess over its ingredients and nutrition information then you may be at risk. You stay away from any food viewed as unhealthy. Healthy individuals may limit added sugar or saturated fat, on the other hand, those with orthorexia avoid this completely. The type of foods avoided vary from person to person depending on what they count as unhealthy. You avoid outings that involve food. You are so obsessed with healthy eating that you isolate yourself and avoid parties, meetings with friends, or anything that may end up in going to a restaurant or activities where food may be served. When obsession with healthy eating takes a toll on your life and happiness, it might be to re-evaluate and seek for help. If you think your social media use may have went just a tad off track, you can reevaluate some triggers. Be mindful of which accounts are truly motivational and which ones share great information with positive messages. Those account will make you feel good about who you are. For example, bloggers that live a completely different lifestyle than you, can make you feel like a failure. A fitness blogger that is in her 20s, cannot always relate to a mother of three kids who works full time. Bloggers that follow a similar lifestyle as you, are more likely to set realistic motives for you. Unfollow accounts that make you feel overwhelmed and down because you cant meet the same expectations. 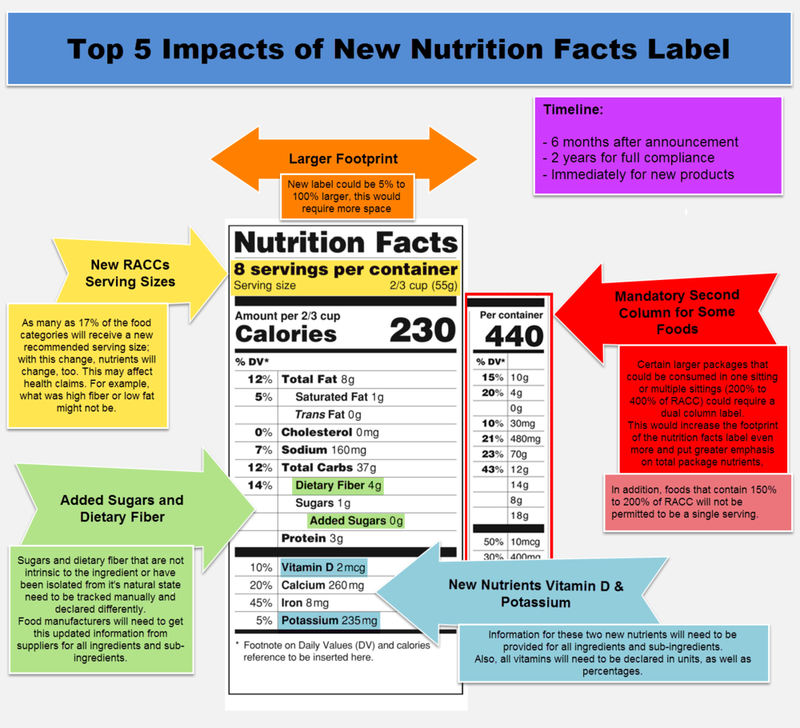 New nutrition label release and how to use it to your advantage! As a nutritionist, I have seen many nutrition trends come and go. We were once told that margarine is healthier than butter when in fact it did more damage in forms of cardiovascular disease. Today, we have many other trends pop up but are they actually good or just temporary? Will they backfire in a couple of years? As for nutrition trends, they will always be just trends. I like to use the old school method of what is good for my body and that is by simply reading the nutrition label. The USDA released a new label which will pop up on packages between now and 2021. I will guide you on how to use it for better health and weight loss! Notice the calories and the number around them. The new label will have the calories, serving size, and servings per container in a bigger, bolder font. Calories are very important to take note of but even more important are the serving sizes and servings per container so that you can track how much you are eating. Most labels contain measurements in fluid ounces or milliliters, and ounces or grams. The most convenient way to measure out your serving sizes are via a scale or measuring cups and spoons. Both are a great investment for not only measuring foods, but also keeping track of how much energy you’re consuming. As you may have heard before, a calorie is not just a calorie, therefore counting calories for weight loss may be easy but may not produce the results you want. Identical foods such as a red apple will not have the exact same calories as the red apple next to it of the same weight. 1 serving meat = size of a bar of soap. 1 serving cooked gran (pasta, rice, quinoa) = about the size of your fist. 1 serving of oil (olive, butter, coconut) = about the size of the tip of your thumb. Use your knowledge on per package info to avoid a binge. Larger packages that can be consumed in one sitting will now be labeled with a dual-column that includes calories for both “per serving” and “per package.” This is only great for saving you some time to take out your calculator if you consume the whole package. It should be a wake up call for many who drink the 20 ounce soda (240 kcal) and full 7 ounce bag of chips (800 kcal) in one day. Packages that are much larger (3 servings or more) are unlikely to be consumed in one sitting therefore are not required to have a double column. Embrace the new added sugars label! “Added sugars” are (yep, you definitely guessed it) sugars that are added to the product and don’t occur naturally unlike in healthy foods like fructose in fruit. As we now know that all sugars are not created equal, and many naturally occurring ones also contain different types of fibers to slow absorption, the label will now help you make a wiser decision. You will notice that pure products such as honey and maple syrup may have a cross-like symbol on the label statement detailing exactly what added sugars mean. These are some major changes that should encourage consumers to choose foods low in added sugars without demonizing foods with naturally-occurring ones. Bottom line, consuming excessive amount of added sugar can lead to weight gain, blood sugar surges and crashes, as well as other medical problems such as insulin resistance, so stick to foods that are sweetened naturally with fruit such as dates. Be aware of which fats to skip on. We finally got over our fat phobia and welcome avocados, nuts, and seeds with open arms. The type of fat we consume matters a lot and that is an understatement. Monounsaturated and polyunsaturated fats are completely healthy, saturated fats should be limited, and trans fats should be completely avoided. Products containing less than half a gram of trans fat are allowed to labeled as 0g. The best way to look out for them is by reading the ingredient list for partially-hydrolyzed or hydrolyzed oils. The new label will no longer include calories from fat but will list “total fat”, “saturated fat” and “trans fat” to help you make wiser choices. Hope you keep these points in mind when viewing a new label. Wishing you smarter and healthier food shopping. Ciao till next week!